The 56th volume of Development is being put together at a time when its subject matter, the question of development, is in flux. On the one hand, new challenges call into question the very possibility of economic growth – and by implication socio-economic development – and on the other hand, the policy world is actively engaged in redefining the shape of the development agenda. In this context, it is perhaps fortuitous that our journal is also in a state of transition. After 18 years at the helm, the illustrious Wendy Harcourt has decided to step down as the Editor. She was, for many of the readers of the journal, the motive force, the moral compass, and the tangible face of the publication. Her strong commitment to poverty eradication, sustainable livelihoods, gender empowerment, and equitable and sustainable development was what gave direction to the journal. Her professional energy and editorial skills – commenting, criticizing, applauding, and refining – were responsible for the enhanced quality of the articles as well as the pool of writers interested in contributing to the journal. Her personal charm and commitment to quality enabled her to draw together eminent thinkers, policymakers, and wise men and women to the editorial and advisory boards of the journal. In recognition of her enormous contributions over the years, this issue of the journal features a tribute to Wendy Harcourt, including a lead article by Nicola Bullard and personal messages from other members of the Development community. However, the best tribute we can give to Wendy Harcourt is to sustain the legacy she has bequeathed us, to aspire to maintain the standards of quality and relevance, to build upon and deepen the impact of the changes she has introduced, and most of all, to make sure that Development remains a valuable source of information, analyses, and dialogue for the people who share its goals and ideals. 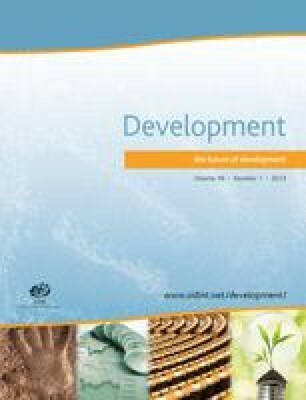 To mark this dual transition, we dedicate this and the forthcoming issue of the journal to the question of the future of development, whether it has a future at all, what is (or should be) the shape of the development agenda, especially the agenda of international cooperation over development, and last but certainly not the least, what is the future of Development. Specific proposals about this and the forthcoming volumes are placed at the end of this issue. Please see Last Word: ‘Structure of forthcoming Issues’. These are exactly the kind of questions that led to the launching of Development (and SID, more generally) in the first place. The motivation was, from the outset, to articulate a practical, pro-poor, and integrated vision of development, based on local experience, responding to local needs and perspectives, and inclusive of groups subject to exclusion, discrimination, or vulnerabilities. Long before it was fashionable or even acceptable to do so, SID advocated focusing on the needs of the poorest and most vulnerable households and groups, establishing forums for dialogue and consultation to balance the conventional partiality towards top-down and technocratic solutions, creating spaces for non-governmental organizations and alternative developmental frameworks in policy forums, and integrating economic, social, and environmental considerations. A short trip down memory lane maybe helpful here. Late 1960s – SID dialogues: Responding to concerns over inequitable development, SID-initiated dialogues helped clarify options, settle controversies, demystify myths and misconceptions, and mobilize political support for the shift towards poverty and equity concerns, later crystallized under the title of human development and the Millennium Development Goals (MDGs). 1970s – North–South Roundtables: As controversies emerged over the international economic order, SID convened North–South Roundtables to facilitate informal discussions and generate ideas. Their impact is visible in the reports of global commissions of the 1980s, especially the South Commission, the convening of the Social Summit (Copenhagen, 1995), the launching of the Human Development Report, and the idea of civil society engagement in policy forums. 1980s – Alternative approaches: In the era of structural adjustment, many developing countries were struggling under the weight of socially regressive and politically debilitating conditionalities. SID pioneered the study of alternative development approaches, people’s movements, and strategies for mainstreaming social goals into development thinking. A concrete example is the SID-WID network, which focused on mainstreaming gender concerns. 1990s – Sustainable livelihoods: The neoliberal global framework marginalized poor and vulnerable groups and concentrated the gains from globalization into a few hands. SID promoted a global conversation between parliamentarians and civil society on human security and sustainable livelihoods to redefine developmental priorities and highlight the coping and adaptation strategies of the poor. 2000s – Bottom-up perspectives: This was a time when many of SID’s radical ideas became mainstream. North–South Roundtables became ubiquitous, the development agenda incorporated social and environmental dimensions, MDGs were launched, and civil society became accepted in inter-governmental deliberations. In this period, SID continued its work on elaborating concerns from the perspective of sustainable livelihoods, gender mainstreaming, and environmental sustainability, and introduced a special focus on East Africa, where SID pioneered the use of futures-based scenarios to facilitate social dialogue during complex transitions. Looking back, it is remarkable how the seemingly radical ideas have now become the new orthodoxy. The organization could have been justified in declaring victory and going home. However. Nature had other plans. Does development have a future? Indeed, Nature had other plans. The scenarios specialist Paul Raskin sets out, in this issue, the immediate challenges as well as their long-term implications: to wit, under a status quo trajectory, ‘long before the end of the century, the world system would veer into a terra incognita of systemic crises as environmental disruptions and social conflicts interact in complex ways, rippling across space and time’. The warning signs have been around for a while, but they burst into popular consciousness and policy debates in the previous decade, and especially since the series of shocks of 2008. Political changes: The trend in developed as well as developing countries is towards a degree of civic restiveness and intolerance, reinforced by steady erosion in the capacity and reach of nation states. Does hope have a future? This is precisely the question that Paul Raskin sets out to answer. His scenarios analyses lead him to suggest that the elements of hope are present in the deepening interconnectedness of people and all living things, but these are not yet in a coherent or practical form. Raskin sees citizens (rather than politicians or policy wonks) as the alchemists who can convert the random elements into a coherent social movement for change. This resonates with the argument by Stephen Marglin and Tariq Banuri, namely that the proper metric for the debate between economics and ecology is not a technical one, to be settled through appeal to narrow empirical analyses, but a political one, best addressed in the framework of climate justice. Another modelling expert Alan AtKisson, the President of the Balaton Group (founded by Donella and Dennis Meadows, co-authors of the Club of Rome Report, Limits to Growth), reaches a similar conclusion, although expressed in a more popular idiom. It is time, AtKisson argues, to push ‘reset’ on sustainable development – that is, to revert to the original, more normative conception, of sustainable development, neither as a technocratic agenda, nor as the painting of a green veneer onto a broken economic system, but as an integrated framework that joins ‘the solo voice of economics [with] the strong voices of social and natural science, principled political leadership, idealistic citizen activism, cultural questioning of consumerist habits and values, and much more’. This brings out both the importance and the limits of policymaking. On the one hand, one notes the progress in learning from experience, assessing progress, articulating aspirations and targets, and identifying areas of possible collaborative action. Yet, one must remember that beyond such sectoral goals and fragmented agendas lie the more fundamental questions of equity, politics, social justice, legitimacy, tolerance, and trust. The question of technocratic versus political conceptualizations has strong resonance in the contributions to this volume. For example, Alice Hovorka, co-editor of Women Feeding Cities (Practical Action, 2009), draws an important distinction between the political nature of feminist approaches, which she favours, and the more technical formulation of gender studies. Her analysis of feminist foodscapes is designed consciously to address the political context of access to food in urban Botswana. Another contribution along these lines is the interview with Claudio Schuftan, an expert in public health and a crusader for human rights; he argues that the next phase of the development agenda should be grounded explicitly in the human rights framework. At the global level, one of the most significant achievements of the 1992 Earth Summit was the coining of the phrase ‘common but differentiated responsibilities and collective capabilities’. Sheer in its simplicity, the phrase promised a new era of global cooperation based on an equitable social contract. Unfortunately, the ink hadn’t even dried on the summit declaration before developed country negotiators started walking back from it. Today, the question of equity remains the major obstacle to global action on any aspect of sustainable development. What holds up agreement on climate change is not a difference over its technicalities, but over equity. What determines the fate of action on sustainable development is not whether or not there are planetary limits, but whether the text of the agreement should or should not include explicit references to common but differentiated responsibilities, or burden sharing, or preferential or concessional access to technology, or new and additional financial resources. Since 1992, these self-same issues have been discussed up and down the policy food chain, but with no resolution. Success has come to mean that critical questions were skillfully avoided, while failure means that a serious attempt was made to address them. Political and rhetorical energies are concentrated in the articulation and reiteration of problems rather than the identification and implementation of solutions. We have known for half a century about poverty, unemployment, vulnerability, environmental degradation, and violence and discrimination against women, yet the assembled heads of state and government see it fit, in their infinite wisdom, merely to remind us of their unremitting commitment to the protection of the poor, the unemployed, the women, the indigenous people, small farmers, the forests, the oceans, the atmosphere, the ecosystems, and the people living in least developed, landlocked, and small island states, but to stop short of specifying any concrete action or new commitment. Often, the ‘decisions’ are nothing more than the lowest common denominator of stapled together pastiches of reaffirmations of previous agreements and non-committal acknowledgements of new concerns. The inevitable result is that governments, as well as civil society, end up celebrating not the decisions made by heads of state and government, but merely the fact that they met and issued a declaration – and that they provided civil society with an opportunity to come together, network, share experiences, revive contacts, and build new. Paul Raskin may be right in arguing that this will remain too big a challenge for policymakers unless citizens take the lead in creating an environment in which enlightened political leaders are empowered and emboldened. In the mean time, however, there can be no doubt that policymakers are aware of the magnitude of the challenge. This is the first time in history when it could be claimed that almost every head of state or government – not to mention every head of an international organization, private corporation, or non-profit – is knowledgeable about and sensitive to the sustainable development agenda. As evidence, one can point to the proliferation of high-level forums, including the annual climate conferences, the high-level segments of the UN General Assembly (UNGA), high profile summits, especially Rio+20, and several blue ribbon task forces of panels on such areas as global economic governance, climate finance, energy and climate change, global sustainability, and most recently the post-2015 agenda. Furthermore, virtually every meeting of heads of state or government today ends with the reiteration of their resolve to address these challenges. Admittedly this reiteration often tends to take the form of visionary rhetoric rather than concrete commitments or operational programmes; yet, the increased frequency and predictability of such meetings has enabled the policy system to establish milestones and nudge the process in the direction of concreteness. Borrowing a phrase from Fukuda-Parr and Yamin, one could say that the contemporary ‘technology of global governance’ consists of three pillars: indicators, deadlines, and review. This issue of the journal has much to say about the role of indicators, especially the MDGs and the prospective new goals as policy instruments, and I provide some examples below. Indicators have to be related to some form of deadlines. For example, the 2015 deadline for the conclusion of the MDGs, which defined much of the collective global vision of development in this millennium, has concentrated the collective minds on the need for a new post-2015 agenda. Similarly, the Rio+20 conference, marking the 20th anniversary of the landmark Earth Summit, has enabled the revisiting of the question of targets and achievements, and triggered activities for redefining the contours of an integrated approach to development. In response to these stimuli, the UNGA has constituted an open working group for fleshing out possible Sustainable Development Goals (SDGs), and created processes for other decisions, including the MDG assessment and its possible future, the green economy and the financing and institutional framework for sustainable development. We also reaffirm the need to achieve sustainable development by promoting sustained, inclusive and equitable economic growth, creating greater opportunities for all, reducing inequalities, raising basic standards of living, fostering equitable social development and inclusion, and promoting integrated and sustainable management of natural resources and ecosystems that supports, inter alia, economic, social and human development while facilitating ecosystem conservation, regeneration and restoration and resilience in the face of new and emerging challenges. The heads of state or government went on to agree upon or recommend a number of economic, institutional, and sectoral measures, including the formulation of SDGs, and ask relevant international bodies to finalize them over the next one to two years. In her lead article for this issue, the Administrator of UNDP, Helen Clark reflects on the implications of the Rio+20 outcome for the future of the development agenda. While acknowledging the criticism that the conference outcome ‘included no new binding targets, few concrete initiatives, and little new financial and institutional support’, Clark credits the agreement with progress in three broad areas: advances in thinking, collective action, and sectoral priorities. It underscored the consensus over integrating policies and programmes, greening the economy, and using goal setting as a key policy instrument. In terms of the future of collective action, it marked the advent of developing country leadership as well as a more visible role of business and civil society, and it demonstrated the power of the social media. Finally, it agreed on a number of new sectoral priorities, namely sustainable energy for all, zero hunger, measuring human development, scaling up protection systems, eliminating wasteful subsidies, and integrating low carbon development planning. The moment is right to merge the social, economic, and environmental dimensions of sustainability guiding international development … Without ending poverty, we cannot build prosperity; too many people get left behind. Without building prosperity, we cannot tackle environmental challenges; we need to mobilise massive investments in new technologies to reduce the footprint of unsustainable production and consumption patterns. Without environmental sustainability, we cannot end poverty; the poor are too deeply affected by natural disasters and too dependent on deteriorating oceans, forests and soils. Building on this overarching vision, the HLP proposed an ambitious sequel to the MDGs, broadening and deepening its overall aspirations and expanding the list of concrete goals to be pursued. At the aspirational level, instead of the single target of the Millennium Declaration (halve poverty by 2015), it proposes a composite of five transformative shifts, namely (a) eradicate (rather than reduce, or halve) poverty by 2030; (b) place sustainable development at the centre; (c) promote inclusive growth; (d) build peace and accountable governance; and (e) forge a new global partnership. At the operational level, the Panel recommends twelve goals to replace the eight MDGs. Of these, exactly eight are drawn from the previous MDGs, albeit with a bit of cutting and pasting, namely, poverty, gender empowerment, education, health (combined from three goals to one), food security (as a broadening of the hunger goal), water and sanitation, natural resources, and a global partnership. In addition, they propose four new goals – sustainable energy, inclusive growth, good governance, and peace. These recommendations overlap significantly with some of the points made by the contributors to this volume. For example, Bartholomew Armah, Chief of the MDGs Section at the UN Economic Commission for Africa, reports that African stakeholders place the highest emphasis on economic growth as a goal in its own right, and rejected the false dichotomy between economic and social goals. Sabina Alkire and Andrew Sumner of the Oxford Poverty and Human Development Initiative present the multi-dimensional poverty index as a way of broadening the definition of poverty from a head count measure (US$1.25 or $2 per day). Dr Walden Bello, the founding Director of Focus on Global South, reiterates this point by arguing that the objective of assessment exercises, like the one currently under way on development, should not be simply to highlight things that need to be given to the poor; rather, their goal must be to develop a widespread and common understanding of the structural and other factors that condemn the poor to poverty. He concludes by presenting a framework that can enable the addressing of structural and institutional questions rather than one that is restricted to pursuing fragmented goals. Similarly, David Hastings, Curator of humansecurityindex.org presents the human security index as a vehicle for incorporating concerns about peace and security into the development framework. The importance of peace and security, in fact, runs through several papers in this issue, most notably by Walden Bello. However, Bello also cautions that, ‘A simple incorporation of new dimensions is not the answer. … [It] is important to have a more comprehensive paradigm or explanatory framework for why development cannot take off or be sustained. The problem with the classical MDG approach was not that it had no paradigm but that it had the wrong paradigm’. According to Bello, the entire attention of this ‘wrong paradigm’ was focused on domestic rather than structural factors. Sakiko Fukuda-Parr (former Director of the UN Human Development Report Office), and Alicia Ely Yamin (Harvard School of Public Health) appear to agree, advising caution on the exclusive reliance on ‘indicators as a technology of governance’, and on the framing of development ‘as a process for delivering concrete and measurable outcomes … [rather than one] requiring social change, including shifts in power relations’. Their conclusion is based on eleven case studies of the effects of the MDGs, which find, among other things, that not all MDGs are equal, some remained in the realm of pure rhetoric while others received significant increases in funding, some were monitored assiduously while others were simply ignored (MDG8 being a good example), and some in fact ended up thwarting progress because of perverse incentives. These observations are relevant to the new goals being proposed, which, like MDG8, do not appear to be entirely conducive to fragmented or sectoral approaches or to concrete measurement. The risk is that these too would end up being treated simply as rhetorical ideals. A more robust solution would be to use this opportunity to go deeper into the determinants of these larger trends and processes. One can draw many conclusions from these articles, but a simple one is this. The challenges that confront the world today require the highest levels of political sagacity and courage. The global policy community has responded by ‘elevating’ the negotiations process and involving the heads of state and government directly, where there is a higher probability of finding such sagacity and courage. This elevation has delivered some results, especially the three results summarized elegantly by Helen Clark. Yet, when it comes to what is needed, whether, prosaically, a concrete plan of action, or, more ambitiously, the framework for a new global social contract, the process continues to fall short. The proceedings of Paris all had this air of extraordinary importance and unimportance at the same time. The decisions seemed charged with consequences to the future of human society; yet the air whispered that the word was not flesh, that it was futile, insignificant, of no effect, dissociated from events; and one felt most strongly the impression, described by Tolstoy in War and Peace or by Hardy in The Dynasts, of events marching on to their fated conclusion uninfluenced and unaffected by the cerebrations of Statesmen in Council. Pulling the agenda in strategic directions, that is, dragging the policy process to make it address the underlying strategic or priority issues. The classic example is the leadership provided by SID on policy dialogue, which may have provided the template for future civil society involvement in global forums. We are fortunate to have in this volume an interview with Alan Berg, a brilliant example of successful championing a ‘pull’ agenda. Dr Berg has the credit for placing ‘nutrition’ on the global policy agenda. Helping the agenda, that is, accepting and supporting the incremental and piecemeal nature of inter-governmental work, in the hope of achieving steady progress wherever possible, neither letting the best become the enemy of the good nor getting distracted by ancillary agendas, however interesting or compelling.2 This is not without its costs. Money does buy help and generate cheerleading, but it risks undermining the systemic policy capacity of civil society by pushing it into a primarily a service delivery mode. Rallying stakeholders,3 that is, come together as a community to share experiences, articulate concerns, and agendas (often in such cross-cutting areas as gender empowerment, transparency, or human rights), find common cause with other agendas and communities, build alliances and movements, and enhance coherence between different processes and forums. These four – push, pull, help, and rally – are the strategies available to the readers of this journal and their allies in civil society and government, or a global citizens’ movement. But here is the problem. Today, Push is incoherent, Pull is blind, Help is paralyzed, and Rally is overstretched. At the time of the Millennium Summit and the Johannesburg, Monterey, and Doha Conferences, the ‘push’ agenda was highly coherent in opposition to the hegemonic neoliberal ideology. Today, its successor, the ‘occupy’ movement, has not managed to get political or analytical traction. For example, it has not been able to find common cause with the mass protests in the Middle East. Nor has it led to the mobilization of the academic community, as only a few voices, such as those of Walden Bello, Elissa Braunstein, Alan AtKisson, and Sakiko Fukuda-Parr and Alicia Yamin, are raised to warn us against sleep walking back into the arms of a new and improved Washington Consensus. Similarly sparse is the literature on alternative frameworks or ‘pull’ agendas, as the bulk of activist responses restrict themselves to individual sectors or siloes. One could argue that the Millennium Summit itself was the articulation of an alternative, ‘pull’ agenda, based on human development and decent work. The irony is that today the legacy of the Millennium Summit is being used to revive its moribund nemesis, and the language of change is continually co-opted by the mainstream. The development discourse has become as disconnected from development reality as finance is from the real economy. Look at the concept of the green economy. Although Rio+20 endorsed this idea, it failed even to agree on a precise meaning, perhaps to counter the mounting criticism against it. This vagueness forces critics to tilt at shadows – protagonists trust that it will tame the rogue economic system, while antagonists fear that it will be a Trojan Horse to smuggle in a resurrected Washington Consensus. There are questions but no clear answers, will it lead to new forms of conditionality or protectionism, will it be a recipe for top-down control, will it entail a wholesale marketization of nature? The citizens, so to speak, are paralyzed regardless of whether they wish to oppose, support, or lead. Even the groups and individuals who continue to wish to help may be paralyzed by the vagueness of the mainstream policy agenda. The result, by default, is that all energies are devoted to bringing people together, either in global forums, or through new partnerships, in the hope perhaps that solutions will appear miraculously and spontaneously through their interaction. In this situation, the approach pioneered by Development may well provide a solution. From the outset, we have approached the policy process as a kind of partnership between the powerful and the powerless. Such a partnership becomes possible only if the powerless can harness all four elements of the strategy – push, pull, help, and meet – and deploy them in opposition as well as support, to lead as well as to help, to stop as well as to facilitate, and through all this to create spaces in which enlightened leadership can emerge and be empowered. This is the task that Development set out to do 56 years ago. While one can count many successes, the task is far from over. Today, to quote John F. Kennedy, the trumpet summons us again to the long twilight struggle against the common enemies of humankind: tyranny, poverty, disease, and war itself. Let us respond to this summons. The protests of 18−21 July 2001 attracted 200,000 people, several police raids, 329 arrests, 500 injured (60 severely), one death, and widespread allegations of police brutality. They were motivated by the opposition both to globalization and to the legitimacy of the G8 to set rules for the entire planet. This is how international political processes function, for example, ECOSOC, COPs, governing bodies, and even some specially convened high-level events. Notwithstanding growing frustration with the desultoriness of this model of international governance, it remains the default option, as it were, seeking mainly to maintain the channel for dialogue rather than solve problems. These include participation at the relevant thematic forums (e.g., IPF, CSW), personal or written contributions to other high-level forums, and occasional street protests. An example of the last mentioned is the protest at the 2010 G20 in Toronto. These were proactive in support of environmental, indigenous, and gay rights agendas rather than reactive in opposition to expected decisions.